Our partnership with Sarita Handa Exports enabled us to offer our most affordable quilt collection ever. Denyse brought her fresh design approach and unique color sensibility to the entire collection. The quilts were expertly hand-crafted by Sarita Handa Exports, a woman-owned company and one of the leading manufacturers in India today. Any way you look at it, we've got you covered. Two quilts in one! 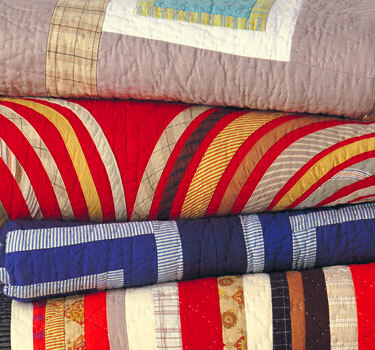 As if the fronts of these quilts weren't fabulous enough, Denyse has designed most of the quilts to feature a beautifully modern patchwork reverse. Turned back, it creates a compelling contrast accent. Flip it over— you've got yourself another quilt.